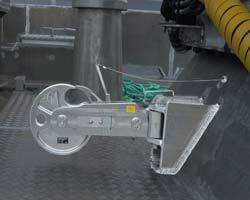 Norway’s Henriksen has released a new range of stainless steel towing hooks, aimed specifically at the small-to-medium-sized vessel sector. Available in three versions, rated for safe working load (SWL) options of 10tonnes, 5tonnes and 2.5tonnes, each of the new hook types has been certified to tow loads up to six times greater than its designated strength, and is compatible with both wire and fibre ropes, and/or steel rings. The hook type is typically bolted down on the stern. DNV GL has certified the new hook range in accordance with its ST-0378 requirements, and confirmed concustomers for this series include the Norwegian Society for Sea Rescue (Redningsselskapet), the Norwegian Red Cross and an unspecified fish farm on the west coast of Norway, the latter of which reportedly relies on the daily towage of feed barges. Henriksen is keen to stress, though, that this product is not intended for tugs; the group wishes to continue to cater to the smaller end of the marine spectrum, in addition to its military clients, instead of increasing towing hook size and capacity to satisfy the tug market's requirement for handling significantly larger loads. Ideal vessel types would include patrol and rescue craft, pilot boats and fishing vessels, the company explains.